The New Order secured another series of important victories in the world of highsec finance this week. Shall we review? king Issier got in on the action, and not a moment too soon. 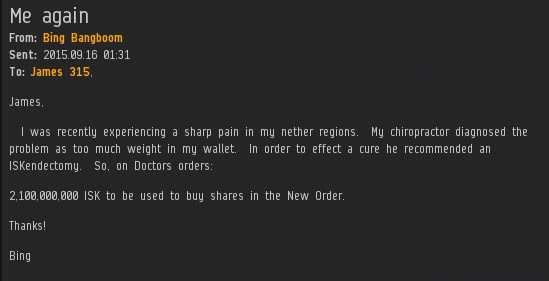 His purchase of 500 shares earned him a Supreme Protector's Tip of the Hat™ for sending us past the 744 billion isk mark. Beginner's luck? Seems more like strategy to me. Next up, Dom Arkaral increased his holdings in highsec's most reliable investment vehicle with a purchase of 1,315 additional shares. This bumped us over the the 745 billion isk mark and earned Dom a Supreme Protector's Tip of the Hat™ in the process. The isk just keeps on coming! Big Gradner Painhaus also chose this moment to increase his investment, purchasing 250 additional shares. In doing so, Big earned a Supreme Protector's Tip of the Hat™ and pushed us over the 746 billion isk mark. Bing Bangboom is at it again! Thanks to Bing's purchase of 2,100 additional shares, we've moved beyond the 747 and 748 billion isk marks. We're so close to the ¾ trillion mark you can almost taste it! Don't be distracted by that, however. Bing got more than a Double Supreme Protector's Tip of the Hat™ for his efforts. He is now the sixth-largest shareholder in the New Order. Almost snuck up on you, didn't it? Bing carefully, quietly moved up the ranks. I told you to watch this guy!